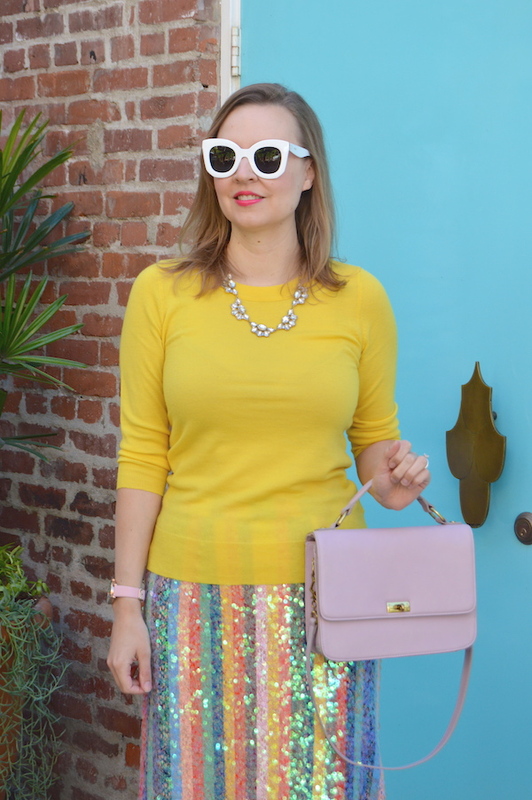 Hello Katie Girl: So Many Sequins, So Little Time! 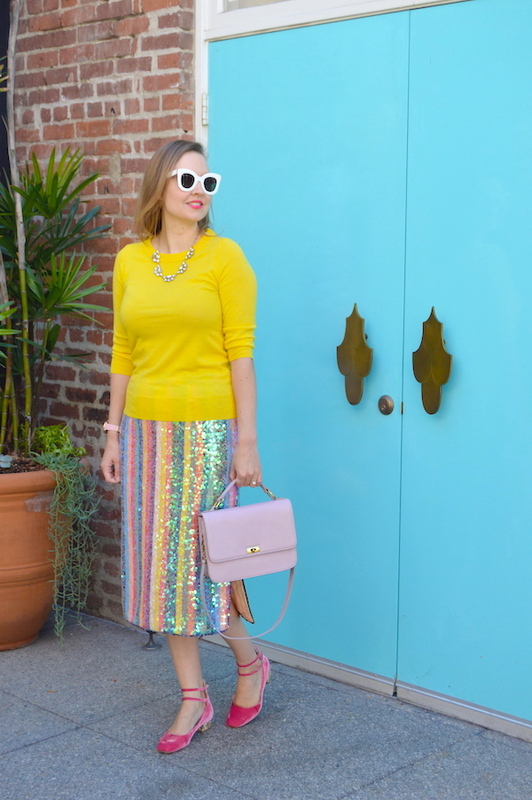 So Many Sequins, So Little Time! Do you ever feel like an article of clothing was just made for you? Like the designer specifically had you in mind when they created it? 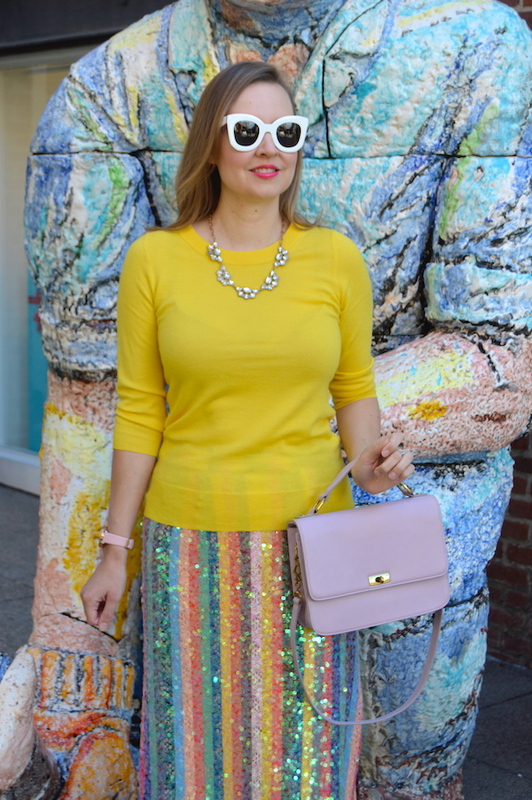 Well, that's exactly how I felt about this rainbow sequin skirt from Anthropologie! 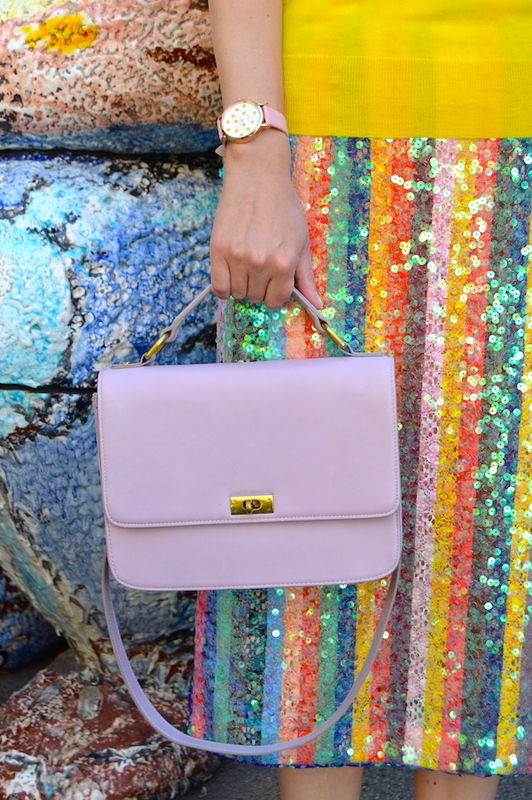 The moment I saw it with its countless sequins and myriad of colors, I knew it had "Katie" written all over it! It was also one of the few things this season that I splurged on and bought for full price, not willing to take a risk of it selling out before I could get my hands on it. With so many colors in this skirt, it was actually difficult to decide what to pair it with, although that's one decision that I don't really mind making! 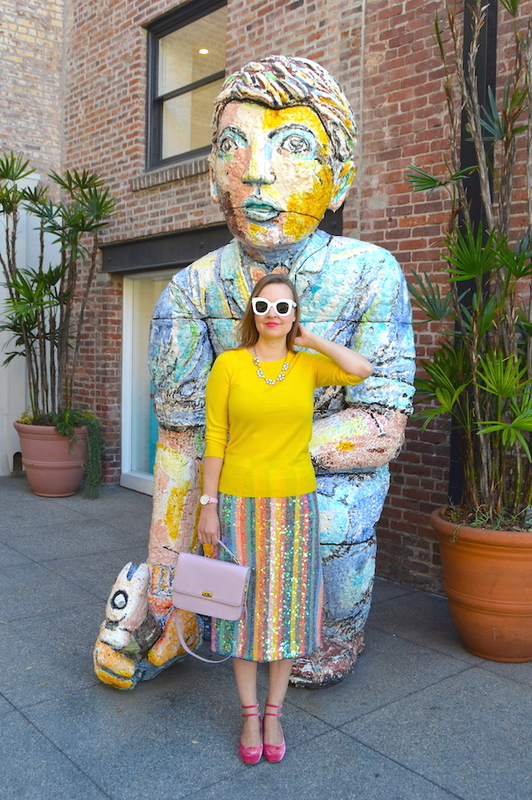 As you can see, I went all out with colors in this ensemble, opting for a yellow sweater, purple tote, and pink velvet shoes. These velvet shoes were another holiday purchase that I splurged on because I was head over heels in love with them! Although they are from last year, Sam Edelman has a velvet pair in a similar color that are almost identical and Boden has a fun pair that has the same gold sparkle heel. You can definitely never have enough sparkle for the holidays, or anytime of the year for that matter! 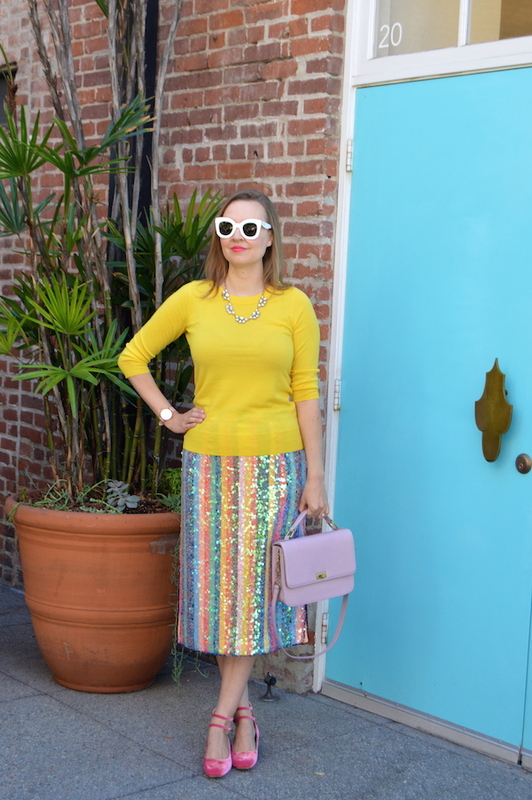 Even though sequins scream the holidays, the pastel palette of this skirt would lend itself to any season, really. I could definitely see myself wearing this in the spring or summer with a T-shirt and maybe a denim jacket, so stay tuned for it next season on the blog! After all, I paid full price for it, so I might as well get my money's worth! I can see why you wanted to get your hands on it. That skirt absolutely has your name written all over it! 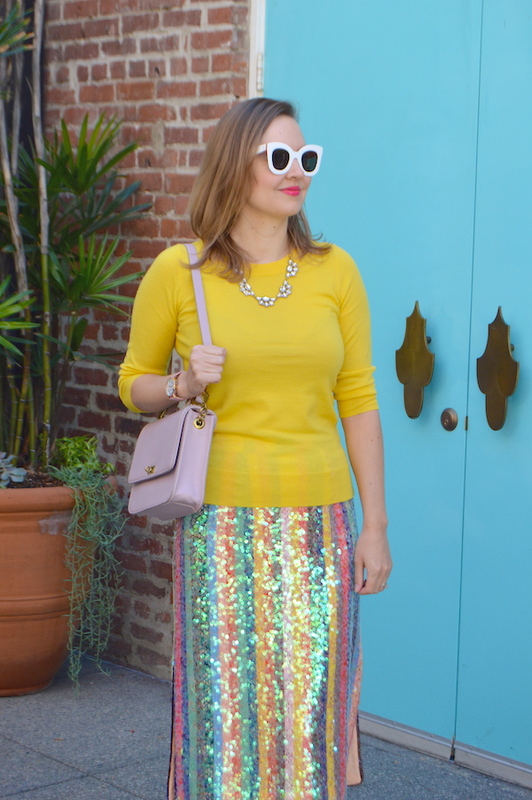 And how lovely to have a sequin skirt in pastels. There are lots of sequin clothes in the shops at the moment but they are either dark or blush. The sequins with the stripes are so unusual. And those shoes - EEK! Velvet delight!